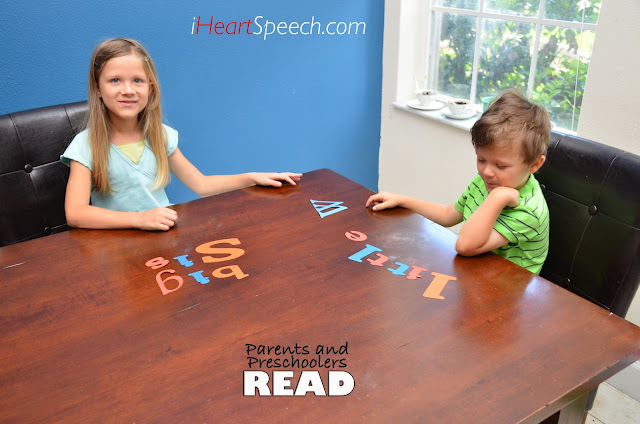 How to play Sheep Round-Up for Speech Therapy Practice at Home! We've had so much fun this month talking about Down on the Farm!! I have been playing this game with the kiddos this week! We use words and sounds based on what errors they have so each time it's a little different. But they have all loved this game!! One of my favorite things to do is to combine classic children's books with real life activities or events. This helps develop a child's understanding (comprehension) of the words on the page but it also makes connections from literature to real life! A few days ago we saw it happen again. What happened? Well, our Milk Weed plant (aka Butterfly Bush) had a few very tiny (and very hungry!) caterpillars on it. Over the past few days we've been watching, counting, predicting and reading! If you do not own a Milk Weed plant, I highly recommend it. They are beautiful with their bright golden yellow flowers. They are interesting with their seed pods that burst with fluff! They grow and re-grow like no plant I've ever encountered (when the caterpillars eat all of the leaves, you think "oh no!" but just wait... in a little while the plant will be covered with leaves again!!) They are conversation starters with neighbors or random people that you encounter in stores who will listen to you tell the story of your very own hungry caterpillars! They are great for the whole family! I love how the caterpillars start out so very small. Below is a picture of how small we usually see them for the first time, but we've seen them even smaller! You can talk about the different sizes of the caterpillars on your bushes! Big, small, tiny, huge! There are SO many caterpillars on our plants. I counted about two dozen and stopped counting! If your child is working on counting skills, this would be a great activity! If counting to 30 is too hard, count the caterpillars on each branch. I see 3 in the picture below! Watching caterpillars is a great activity for kids of all ages! We have two kiddos: Big Sister is now 8 years old and Little W is 4. Their language skills are very different! 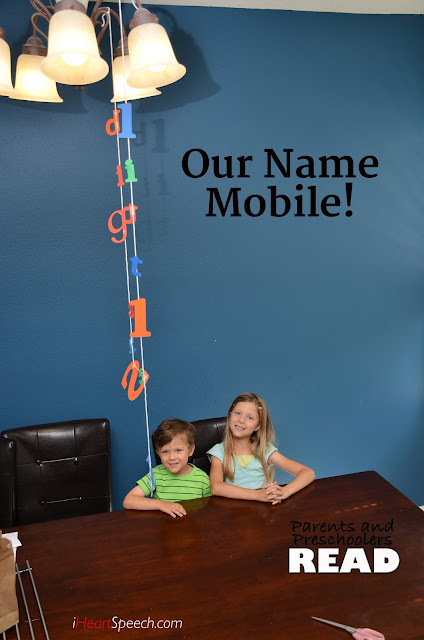 But we like to do things as a family so I am giving some ideas that you can use with kiddos of different ages! Reading together and doing activities together is one of the best things about having a family! With babies - toddlers, they can just observe and you can talk about what they are doing. Crawling, standing (they do seem to stand up! ), eating, searching! You can count and point! Talk about the leaves and flowers. You can touch the leaves (without caterpillars) and talk about not touching the critters! With older toddlers, you can of course observe, but they are much more active! Have them search for more caterpillars and count them! Talk about where they are. Under the leave. On the leaf. On the seed pod. Near the flowers. I have found that kids love to take pictures. Let them use your phone to take pictures to review later. With preschoolers, you can begin to connect the story to the real life activity. Bring out a book about caterpillars or the Very Hungry Caterpillar by Eric Carle. Talk about similarities and differences. Find a tiny caterpillar and one that you think is big and ready to go make a chrysalis to become a butterfly. They can take pictures, too. Have them share the pictures with friends, family and neighbors! Encourage them to tell about the pictures. With early elementary schoolers, you can begin to compare and contrast. Use The Very Hungry Caterpillar book and do a chart of the similarities and differences. Bring in the written component by writing words or sentences. You can also discuss the life cycle of the butterfly! With older elementary schoolers, they can do a research report to find out different kinds of butterflies in your area, information about the migration of the Monarch Butterfly or the types of habitats that butterflies like. They can work on their teaching skills by creating a book to educate a younger sibling. If they like to take pictures, you can use those pictures in the book! I do have a confession.... I do not love all caterpillars. There are some that eat my garden plants! My fennel! My parsley! My tomatoes! Noooooo! Those can be taken care of; mostly we move them to the woods across the street. They sure are beautiful....but not good for my garden! The wonderful thing is Monarch Butterfly caterpillars only eat Milk Weed. I had that plant right next to all of my favorite garden plants and I never saw them close to my plants! Inspired? Please share this with a friend! Let me know if you have a Milk Weed plant and if yours have caterpillars on them? If you are considering Speech therapy or have been referred to a Speech Pathologist (SLP) by a doctor or your child's school, there are a few things you should know about to get the most out of this experience! 2. 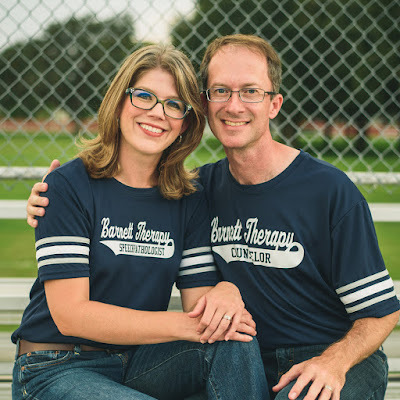 Find A therapist that you like. 3. Understand and DO homework! 5. Get school staff and the family involved. Ok - now for some details about each of these! We are starting our Parents and Preschoolers READ series with a classic! Chicka Chicka Boom Boom by Bill Martin, Jr and John Archambault is a cute, rhyming story of the little letters trying to all climb up a coconut tree. While there is a bit is mischievousness 😏 in this story, it has great repetitions of the names of the letters and is a must read for all preschoolers! We decided that we would have the letters in our names "climb" our tree! First, we got to experience a Mystery Bag. This is a favorite for my own children and many of my therapy clients. Anything in a bag is more exciting than if it's just on the table! 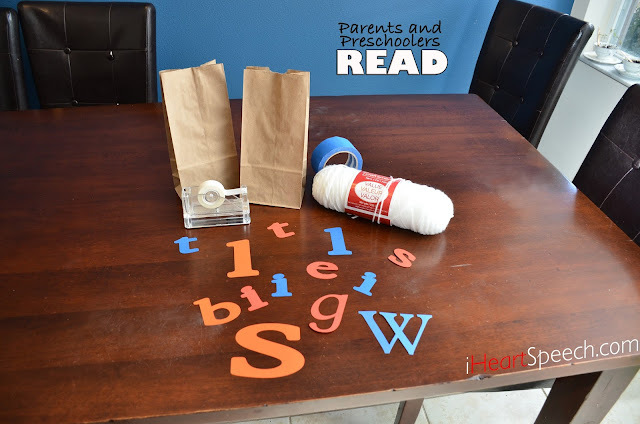 You'll need brown or white lunch bags, the letters in your child's name (we used a craft cutting machine, but you can print them out on plain paper and cut them out), and for later you'll need yarn and tape! I filled the bag with the letters in their names! They got to dump out the letters and put them in the correct order. 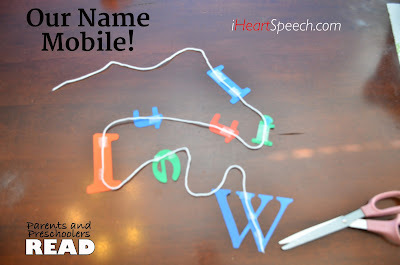 Little W is still working on the spelling of his name, so this is a great activity for him right now! After we correctly spelled our names we took our letters outside. 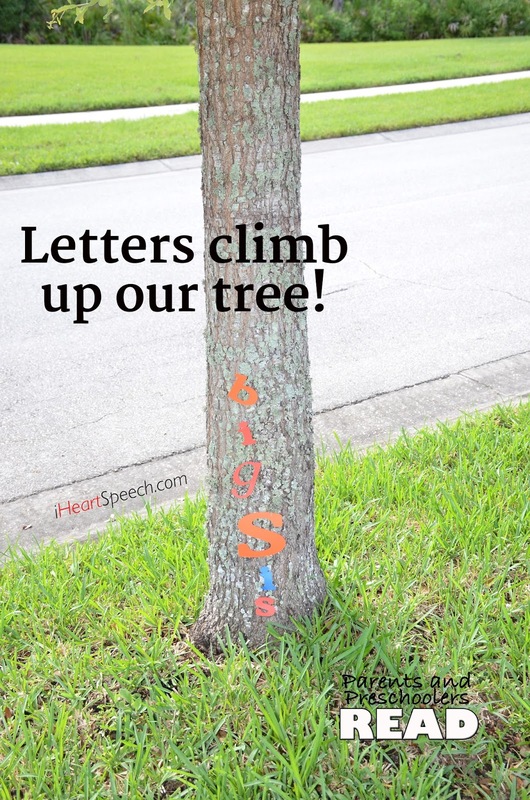 We used the rough bark on the tree to keep our letters secured! 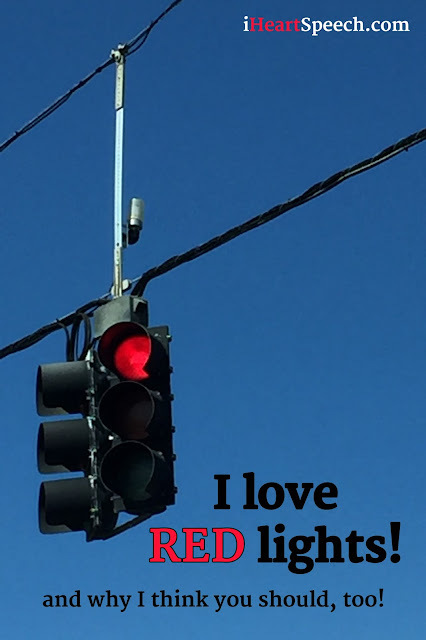 Just a note, even a light breeze blew them right off! So, grab that tape and tape the letters on if you need to. After we finished our names (and they spelled out both their blog names - Big Sister and Little W, as well as their real names! ), we took the letters inside for our final activity! We laid out the letters one more time and taped them to a long piece of yarn. I then tied the yarn to our chandelier. They loved seeing their names dangle over the dinner table!! This was a super fun set of activities that both of my children enjoyed! If you are not interested in having your child's name hanging in your dining room, you could tape the letters with the yarn going sideways like a pendant garland and hang it across their bedroom door! Or pin up the ends on the wall in their room! So many possibilities!! Each time they look at it, they will remember the fun but also have a positive experience with letter recognition and books! We grabbed the Chick Chicka 1-2-3 by Bill Martin Jr and Michael Sampson. It is the same cute, rhyming pattern but with numbers 1 through 20 then the 10s numbers to 100! It's great, too!! We also did a bonus video with this one. We found the movie version of the book while we were at the library. It was a great way to end our day! Want these for your own home collection? You can purchase them on Amazon. Or grab them at your local library!! 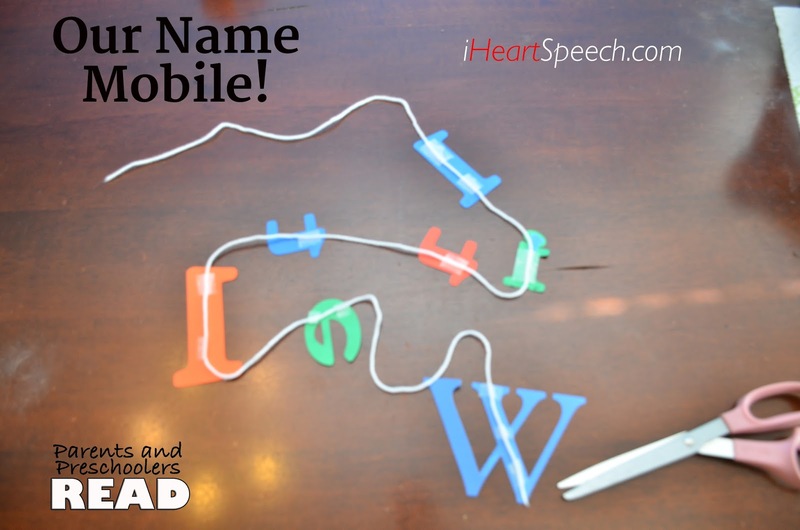 Want to do more than just get through a book with your preschooler? I know you know that there are so many good things you can do with books with small children to develop their communication skills. The problem is, parents don't always know what to do. Or they know what to do but lack the inspiration to do it. Come along on our journey into 35 of the most popular children's books. I'll provide ideas and activities, special moments that we've shared and some blunders along the way! We can laugh together, cry together (some of these children's books make this mama's heart swell!) and learn together, too! 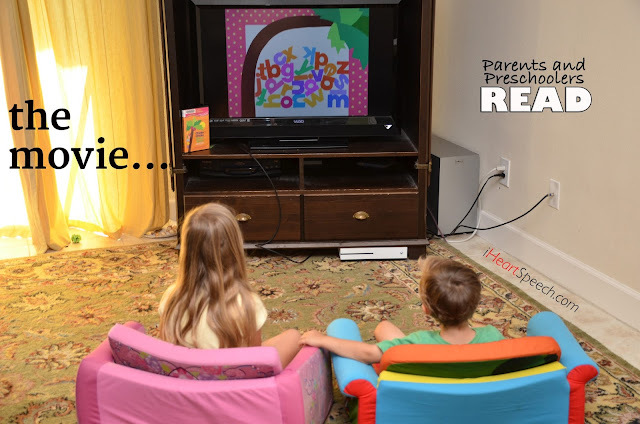 Check out our newest blog series: Parents and Preschooler READ! Reading with Preschoolers - Tips to make reading more fun! Do you love to read with your preschooler or does it get a little boring to read the same books over and over and over and over? I go back and forth between super excited about a book and totally bored with it. But, I have found a few ways to make it more exciting that I would love to share with you! If you've read my blog for any amount of time, you'll know that I love field trips! Now, these are not class field trips, just family field trips! Almost any store, building, restaurant or location can become a fabulous field trip. 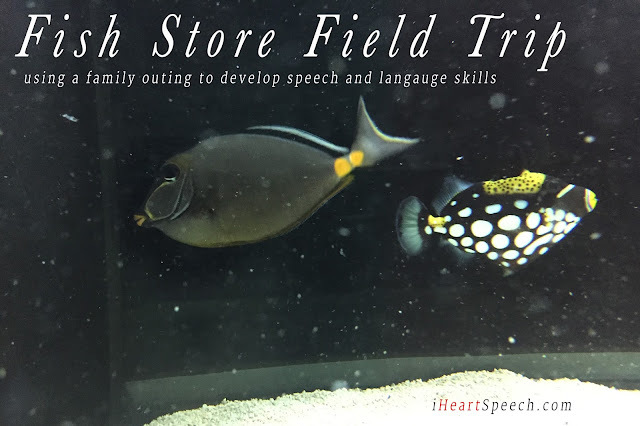 Use can use these outings as a way to develop your child's speech and language skills! Our most recent trip was to the fish store. Do you know how many cool things there are to see at a fish store?! However, the fish store is awesome!